New York, NY : Harper Audio, 1992. This is an abridged audiobook edition of The Ghostway, performed by Gil silverbird. This audiobook was produced by Rick Harris and directed by Lauren Krenzle. The book was abridged by Sharon Holland with music by Robert Kessler and Ethan Neuburg which was recorded and mixed by Richard Romaniello. It is recorded on 2 audio cassettes, and includes a cardboard case with a full color printed cover. 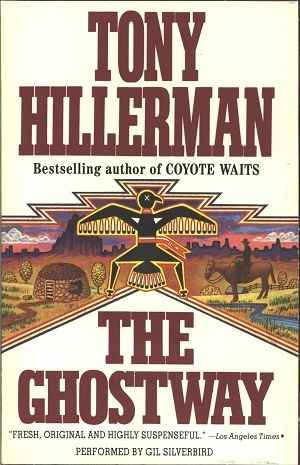 The the cover is based on the Harper paperback edition published the same year and designed by Peter Thorpe. Each side of the cassettes runs about 45 minutes for a total of about 3 hours running time. The abridgement was approved by the author.